We bake and frost 13 signature cupcakes each day. We also feature some specialty flavors each day. Check our Daily Flavors page and social media pages for the special flavors. Vanilla cake with buttercream frosting topped with sprinkles. Chocolate cake topped with our signature chocolate buttercream. Chocolate cake filled with our signature buttercream topped with our signature fudge frosting with a dollop of buttercream. Chocolate cake with our signature buttercream frosting, chopped peanuts, hot fudge, and a cherry on top. Chocolate cake with peanut butter cream cheese frosting topped with crumbled peanut butter cups. Vanilla cake topped with our signature chocolate buttercream. Vanilla cake with our signature pink buttercream frosting. 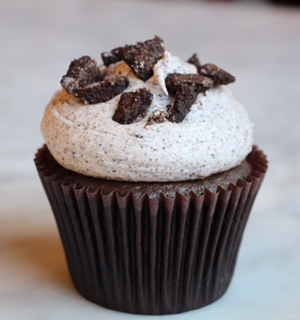 Chocolate cake with our signature cookie buttercream topped with chocolate cookie crumbles. Grandma’s red velvet cake with our signature cream cheese frosting. Vanilla cake filled with tangy lemon and topped with lemon buttercream and a dollop of tangy lemon. Chocolate cake with our signature pink buttercream frosting. Almond cake with our signature almond buttercream. Strawberry cake with strawberry frosting and topped with a strawberry slice. Smallcakes cares about our customers’ well-being and satisfaction. 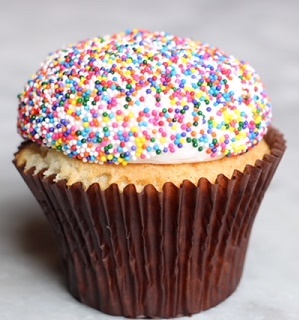 Our Allergen Information is as follows: While we offer gourmet cupcakes without nuts and/or gluten, all of our desserts are made fresh every day in the same kitchen. Though safety and sanitation are of the utmost importance to us, the potential for cross-contamination does exist. Our kitchen regularly prepares items with peanuts, tree nuts, nut oils and butters, and gluten, and therefore, cannot be certified as a nut-free or gluten-free product. Please speak with a Smallcakes employee for further questions.